A for effort definetly, yet I still feel if they changed the Z car the number shouldn't of changed completly at this point in the car's history. Meaning they should of waited before such drastic changes. look at the Porsche it looks the same for how many years!!! If I were nissan I would of discontinued the car for 2 or 3 years while the they test engines of then 3.8 now 3.7 engines until power was high enough for another return. I know that if all this is taken into consideration that the prices goes up. Ok, just like most of us on this board we just have to wait an extra 6-12 months for a decent down payment. If you like the Z car for it's appearrance you get the base car which should be just the car. Not the whole Z car feel. Don't get me wrong engine size stay's the same, not a fan of different engine sizes. I feel with the Z "handling" is the only thing that should change as u go up in trim. I feel the Z doesn't and never gonna be the fastest entry level sportscar. One of the best handling I think it is, and I feel that's what should be on there minds. You know other car guys can brags about quarter mile times, yet turn one through straight away it's a different conversation. What I wanna say for all the faint of heart, is when spiritly driving with another brand car and they got your ***** and there is a turn or slight right on the highway, and they have to slow thats why I love my Z car. That left right, I'm gone motion. I agree, Nissan jumped into the 370Z too quickly. To each their own I guess... I think it looks great. I'm willing to bet a lot of people who hate it now will be eating their own words when they finally see one in person. How much longer did you guys want the current body style? 10+ years? No kidding. Makes me laugh whenever I see people whining about inevitable design changes, and I really see this as an improvement over an already great design. People are just really scared of change and of having their "baby" become the last-gen model, I guess. I'm guilty of being a hater when I first saw the 370 on this board. I really thought the headlights looked like complete ***. As time has passed and the camo has been coming off in bits and peices; I have to say that the new Z is looking better than I had anticipated. I love my 05 and don't plan to trade up for it. My plan is to pay it off, keep it, and wait for the new Camaro Z28 which should be relaesed in the 2nd year of production. I still think the 370z will be a smash hit. But having got my z this summer I think I'll be satisfied for awhile. I have to admit, when the Z33 came out I was still in love with the Z32 styling. It took me a few years for this body styling to grow on me and now I own a '05 model. People just don't like change I guess. Z34 FTW! I love it. Nissan is doing a GREAT job and made the right move. I agree. Everyone that hates it really hasn't seen the debuted version. Let alone the actual HP and engine specs. I can't wait to see all the naysayers jump on the new Z's *****. I like it - I won't be trading in my '06 anytime soon, but I like it. You can feel the 350z influence and yet from the side view I think you get a 280z type feel. I lost my Z to hurricane Ike. And now I'm in confusion. Do I wait for the 09 or get another 08. I like the idea of the shorter wheelbase and more powerful engine. Whats up with that huge flat part around the fenders? Ruins the look of the car. How the hell did it make it to final production like that. Nissan needs to hire some new designers. Man, I remember how many people didn't like Z33 when it came out, including myself, I was doubting it as well. Time will change. Seriously, you really want the same body styling for another 2 years? Change will always happen, and it will never please everyone, that's just life. I'll take a Z34 in red. I hate many outside design cues in the 370z from what I see so far. Yes, a design change was going to happen and sometimes its better, but not this time. How many of you seriously would drive a Crossfire??? Some designs are just ugly. This design feels incomplete and half ***'d. The only way I would get a 370z if it comes turbo'd from the factory. Its like being with a girl that has no ***, or ****, but has a pretty face and money. They are some things that you like about her but you really love her for money. hate it or love it, it is what it is, the next generation z. as long as nissan continues the z, i'm content in that. 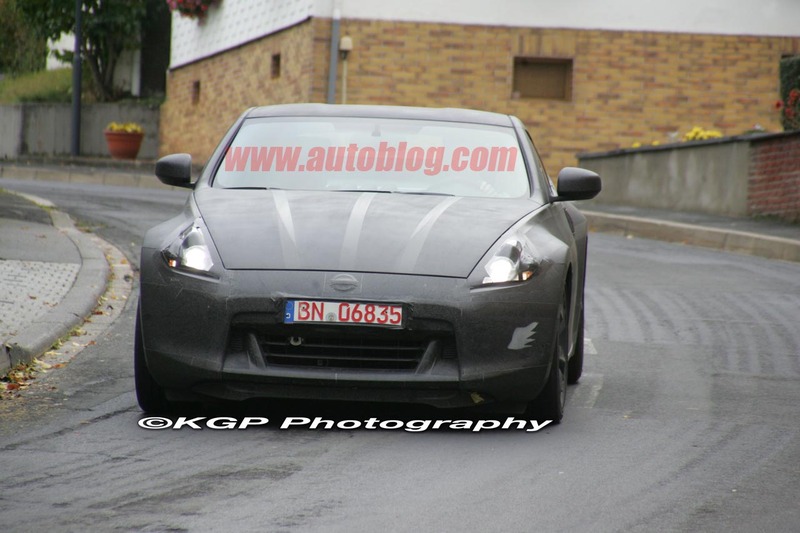 I can agree and disagree..In my eyes the 370z design doesnt seem to be straying from the 350z to drastically. I would just enough to see the 350 and 370 in my driveway. I could see them having stopped production of the 350z in 07' and waited another 3 or so years to break in the 370z. I just have a bad feeling the Z is turning into the mustang. New model after new model with the Z looking so similar and then they turn out to be everywhere.